We finally got a break from the summer heat last weekend. With morning temps in the high 50's and afternoon highs in the low 80's, it was time to hit the woods for the first time in months. After several hours of chainsaw work clearing trails, I got to do a little pre-season scouting. At this time of year, my scouting plan is not about trying to figure out where the deer are. I'm focused on trying to narrow down the locations where they will be when bow season opens - about six weeks from now. Basically, I'm taking an inventory of the food sources that will be available starting in late September, identifying the spots that have a high probability of becoming dominant trees, and marking those spots on a topo map so that my scouting time will be more efficient when the season rolls around. If you aren't familiar with the concept of dominant trees and how to find them, take a look at this article and the four followup articles on dominant trees. My first stop was at a grove of very large chestnut oaks. Bumper crop! The acorns pictured at the top of this page were laying on the ground and there were thousands in the trees. There is a very good chance this is where I will be opening day. 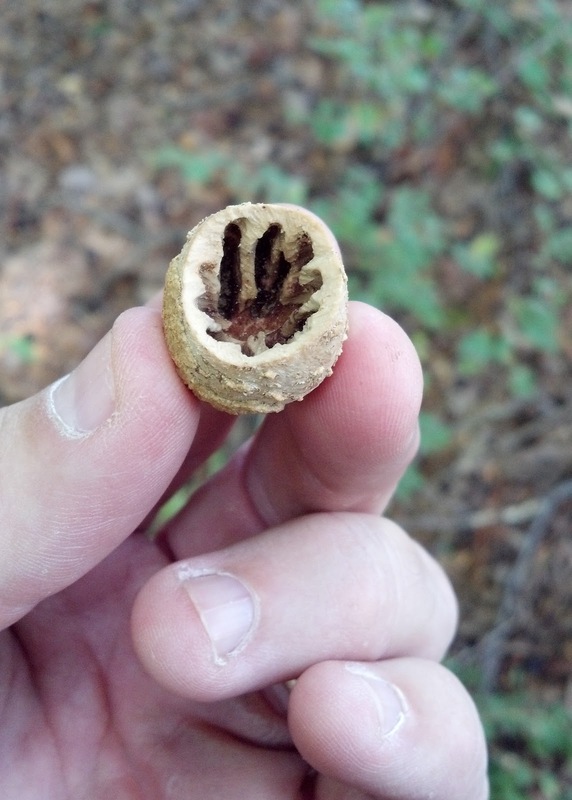 I've heard lots of hunters say that deer won't eat chestnut oak acorns. That is half-true. 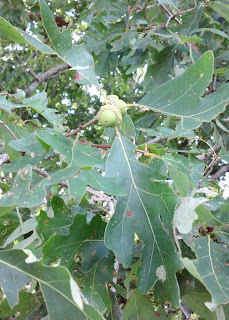 They won't eat them if there are other species of acorns available, but in middle Tennessee, the chestnut oaks usually start dropping a week or two before the white oaks kick in. During that time, when chestnut oaks are the only game in town, the deer will hammer them. Witness this deer i killed on his way to feed on chestnut oaks. It looks like we will have a good white oak crop this year. I found that most of the white oaks that regularly produce acorns where I hunt had good quantities of nuts. 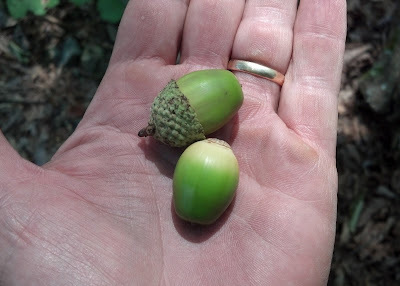 It seems like the acorns are a little less mature than I would expect for this time of year, so it may be a late drop - another reason why I'm excited to have good chestnut oaks this year. In my area, we have several species of trees in the red oak family - northern red oak, southern red oak, scarlet oak, and black oak are the most common. Most of them start dropping after the white oaks have finished. I don't expect as good an acorn crop as we had last year, but there look to be enough trees with nuts to provide fresh acorns well into gun season. This southern red oak had a good crop of immature nuts. This looks to be the best year for persimmons that we have had in quite some time. Just about every female tree I checked had fruit in good quantities. 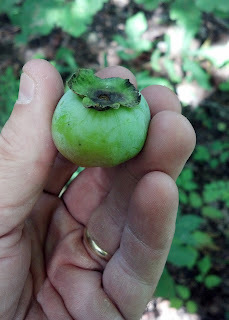 This green persimmon I found on the ground was obviously not ripe yet, but it was developed to a fully mature size already. If the white oaks are late in dropping this year, persimmons could move to the top of the deer's feeding list if they are on the ground before the white oak acorns. I'm looking forward to hitting the woods for squirrels in a couple weeks and I have a couple spots picked out already. The hickories are loaded and the squirrels are already cutting on 'em. I hope this little scouting report is helpful. Leave a comment and let me know what you are seeing. Thanks for all the information on the sight! This year I have been researching my areas and have learned to add these lessons to my hunting this year! I have seen trails under several dominant trees and have noticed the difference in certain areas via food source and surrounding brush etc.. Keep the info fresh! I'm loving it! I can't begin to tell you how much I appreciate the amount I've learned from your site over the past few days. I've been scouting a brand new refuge that the state just bought about 2 miles from my house. I can't tell you how excited I am to finally be able to hunt these woods after all the nice deer I've seen while fishing a bayou that runs through part of the refuge. I have been scouting the woods daily for the past week and have marked multiple white oak and persimmons on my gps that I plan on checking once mast starts to drop. 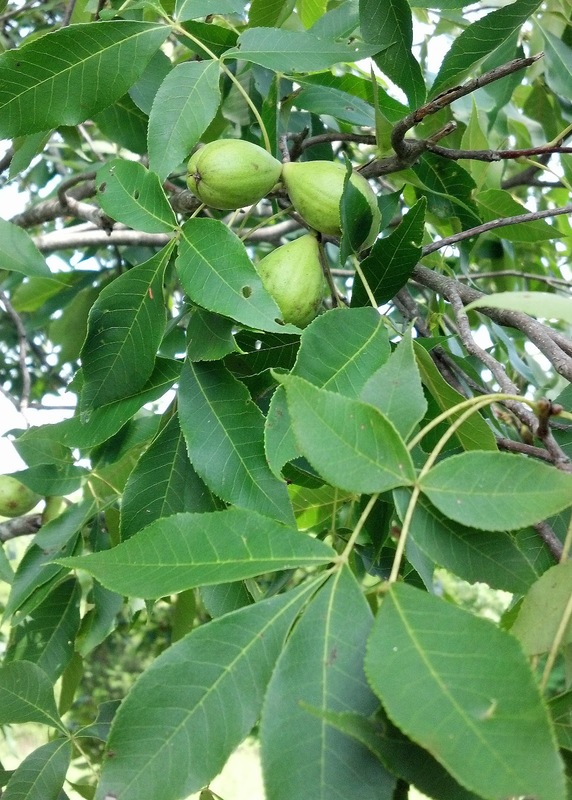 I have one tree question that I haven't seen addressed on your site and that is the Pecan. Here in Louisiana there are loads of pecan trees that run the banks of the bayou on this refuge. I wanted to know if you have any experience with this. I plan on checking them once they start to drop later in the season, assuming deer will wait for the green husks to fall off before they eat them. I'm hoping this will turn out to be a good late season pattern for me. On another note I wanted to let you know about a doe I saw eating ragweed today like you said. I'd been looking for some ever since I read about your Ragweed Buck story and never saw any until I saw this doe with her head down. After she left I went to see what she was eating and sure enough it was a big patch of the first ragweed I'd seen anywhere. Which gave me all the more confidence in your advice. I truly cannot wait another month for the season to open to get out there and put all of this knowledge to the test. I look forward to hearing your advice on the pecan trees. 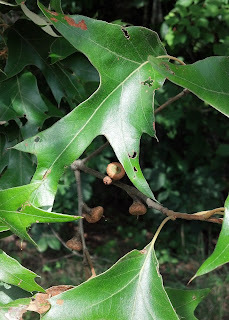 Which by the way look an awful lot like White Oak until you follow them up and see the broad leaves. They have the exact same color flaky white bark. Thanks a lot. I'm glad you are finding the site useful. Thanks for the kind comments. We don't have pecan trees where I hunt so I don't have any experience with them. To be honest, I dont know whether deer even eat them. I have been told that they will eat hickory nuts if there are no acorns around, so it makes sense that they would eat a pecan. I would scout the pecan trees just like any other mast-producing tree. If the deer are feeding on them, you will know it by the fresh sign they leave behind. 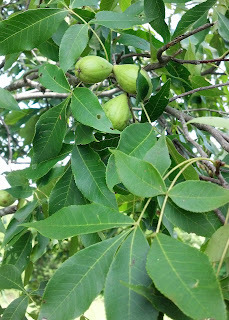 I have used the same scouting techniques to locate and kill deer under osage orange and locust trees in bad acorn years. There is one certainty with deer. They are eating something. The fun part of hunting for me is figuring out what that something is. Best of luck to you this season. Drop a comment and let us know how it is going.